CoEnzyme Q10 (CoQ10) is also known as ubiquinone and vitamin Q. CoQ10 is an essential component of mitochondria--the energy producing unit of the cells in our bodies. CoQ10 supplementation can support a healthy cardiovascular system, act as an adjunct while taking statin medications for hypercholesterolemia, help support the immune system, and provide a positive effect on many organ systems. CoQsol® is an oil form of CoQ10. CoQsol® has been clinically studied in humans and has demonstrated superior absorption over CoQ10 powder in hard shell capsules. 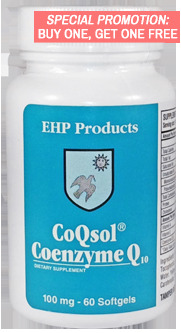 Our CoQsol® brand of CoQ10 is of the highest quality and provides maximum absorption. The superior ability of CoQsol® to increase basal blood levels of CoQ10 is what defines it as the best. Moreover, our CoQsol® softgels are 100 mg strength, not the 10 mg, 15 mg, or 30 mg strength of other distributors. Buy One, Get One Special: Order one bottle of CoQsol® CoEnzyme Q10 Softgels (60 count) and get another bottle for free. Offer also applies to larger quantities (ex. buy four bottles and get four bottles for free). Offer valid while supplies last.